Beaches in Maine are part of what make this state “Vacationland.” Maine is part of New England, and is the north-easternmost state in the United States. Maine shares a border with Canada, New Hampshire and the Atlantic Ocean. Beautiful rugged landscapes, idyllic coastal towns, and rocky coastline are dotted with glorious sandy beaches. Tourists will find ample opportunity to enjoy beaches in Maine throughout its warm, humid summers. The coast of Maine is situated along the ocean, so water temperatures remain cool throughout the summer. This doesn’t mean that you can’t go in the water, but the dip will usually be a refreshing one. 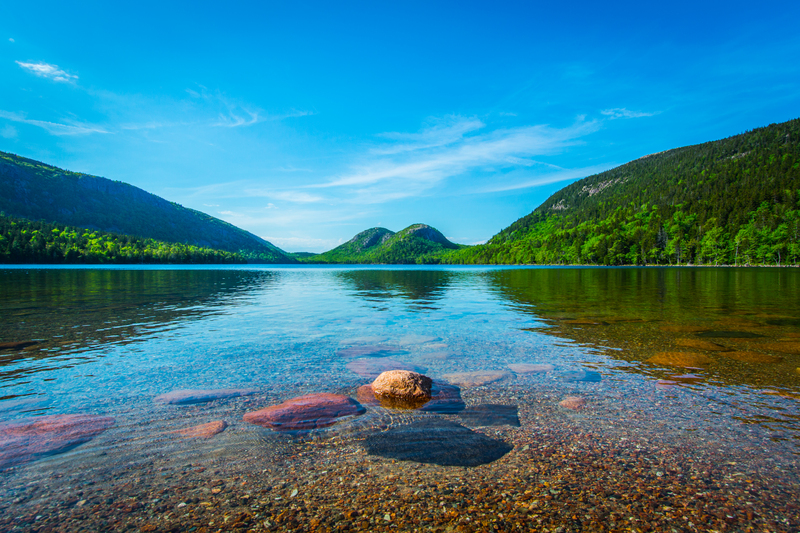 Though its main attraction is its long coastline, Maine also has many inland lakes. Sandy beaches at these lakes offer picturesque backgrounds, as inland Maine is largely surrounded by forest. It’s not uncommon to hike through a forested path and end up at a beautiful watering hole with natural shade (and convenient beach amenities). There are a mix of shallow warm waters, and clear cooler, deeper lakes which offer variety to please every type of beach goer. Beaches in Maine also attract wildlife. In the state you can go whale watching and bird watching – you’ll find puffin colonies and migrating shorebirds galore!